← Happy 37th anniversary to us! 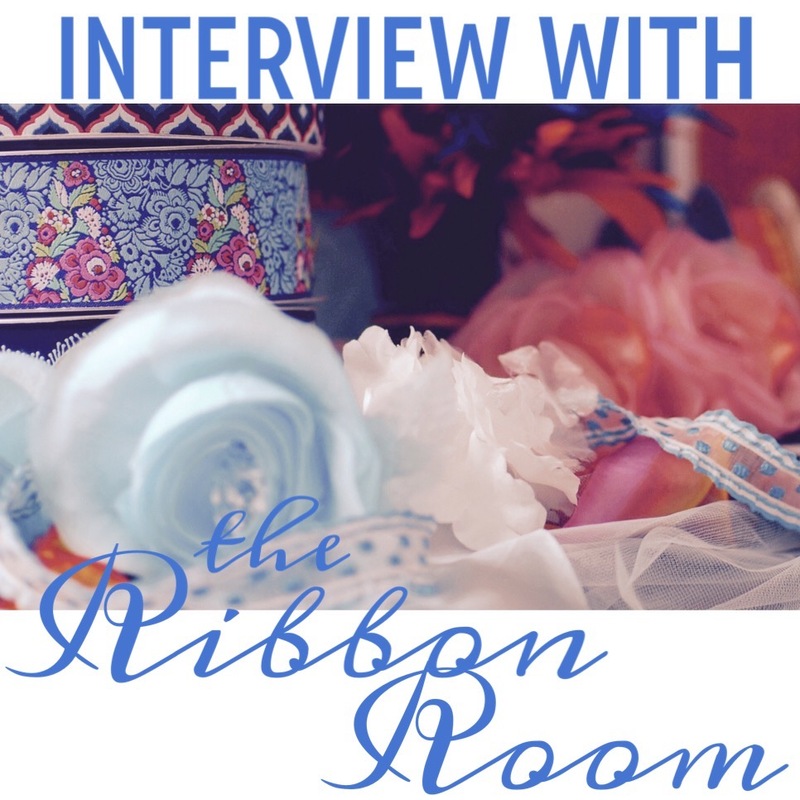 Today we get to know a favorite space in the store – the Ribbon Room! Hello, I’m the Ribbon Room! Where do you reside at Nancy’s? I have a cozy little room in the back right-hand corner of the store. Because I have my own room, some people miss me on their first (or second!) visit to the shop. Yes! 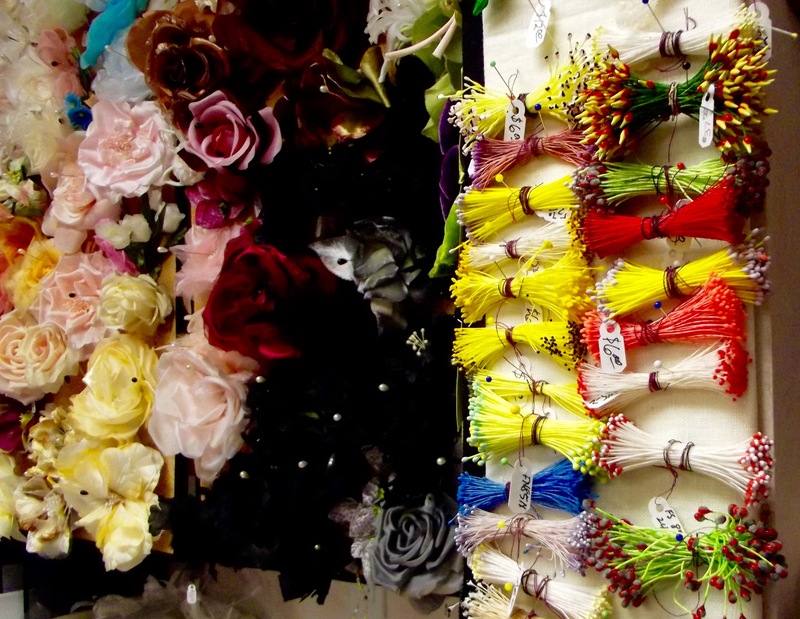 I am home to the exquisite ribbons and trims carried at Nancy’s, in addition to millinery supplies like flowers and veiling, specialty buttons, and fun little gifts. 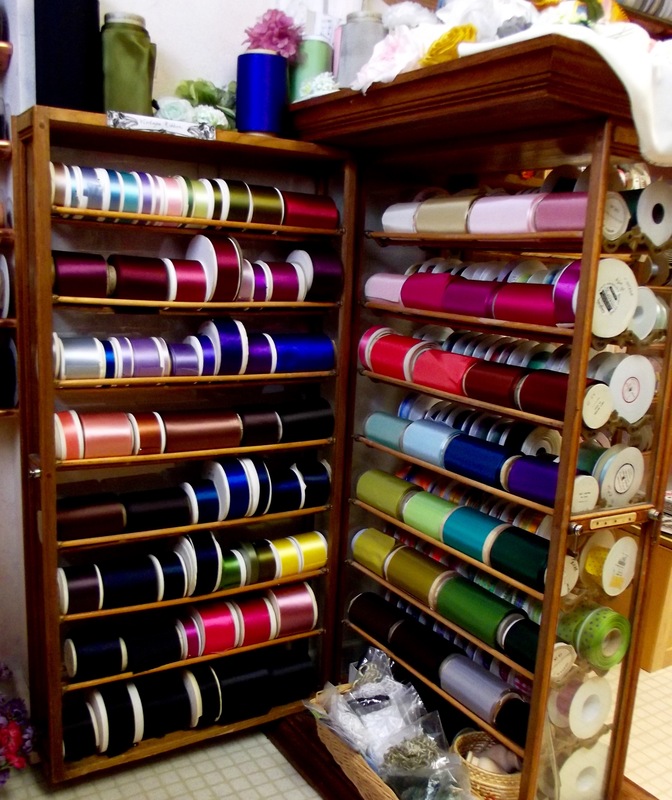 For ribbons, there are lots of great basics – like rayon Petersham grosgrain, double-face satin in both silk and polyester, and sheer polyester organdy ribbons – but we also have an incredible selection of vintage ribbons, heirloom laces, and trims. 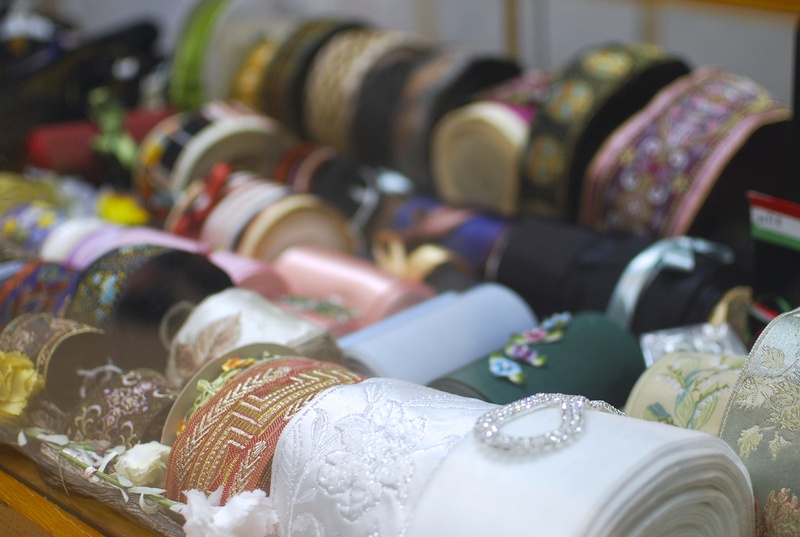 The ‘dessert’ case holds some of our most beautiful and expensive ribbons and trims. Many are vintage, some are reproductions, all are truly exquisite. 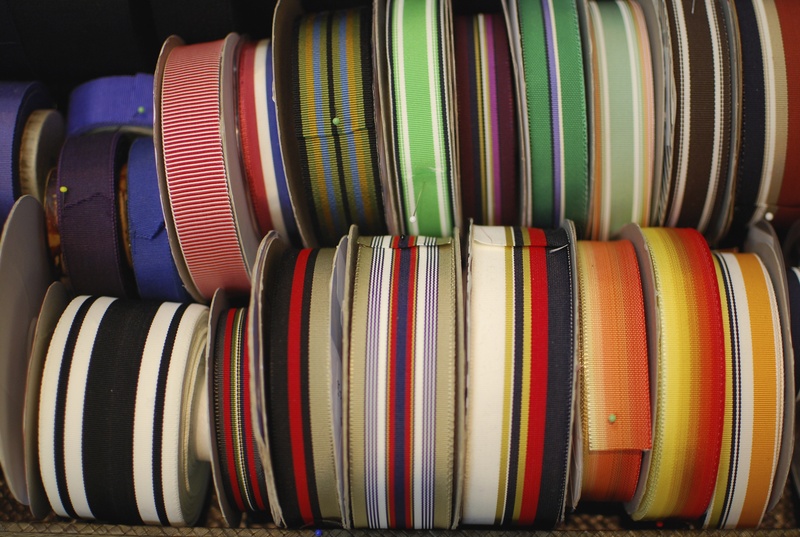 As Susan, the ‘ribbon lady’, puts it: the Ribbon Room is where we keep the dessert. What is your most recently received product? We just got a large shipment of lovely millinery flowers, including some fun little toadstools! We also received a fun selection of vintage flowers. Do you have a current favorite product? 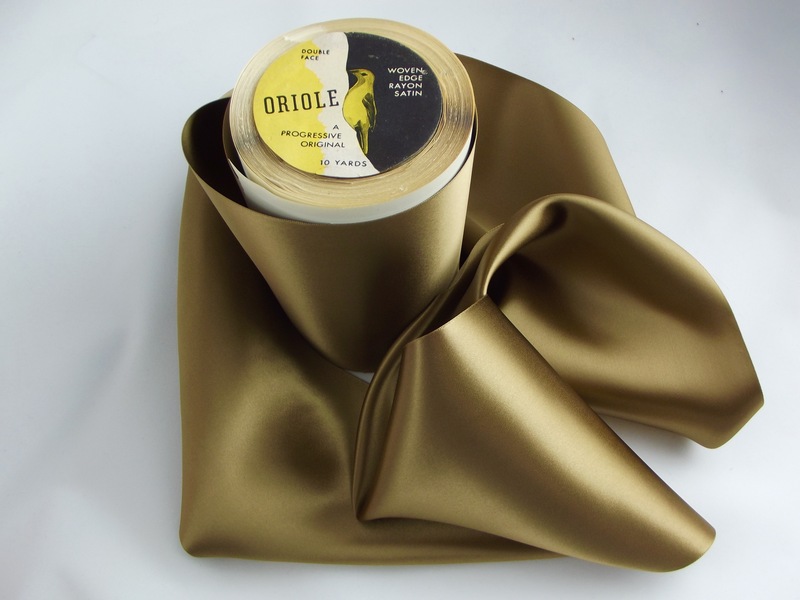 A few months back we got a huge selection of vintage ribbons, including exquisite taffeta and lustrous satin in a rainbow of interesting colors. 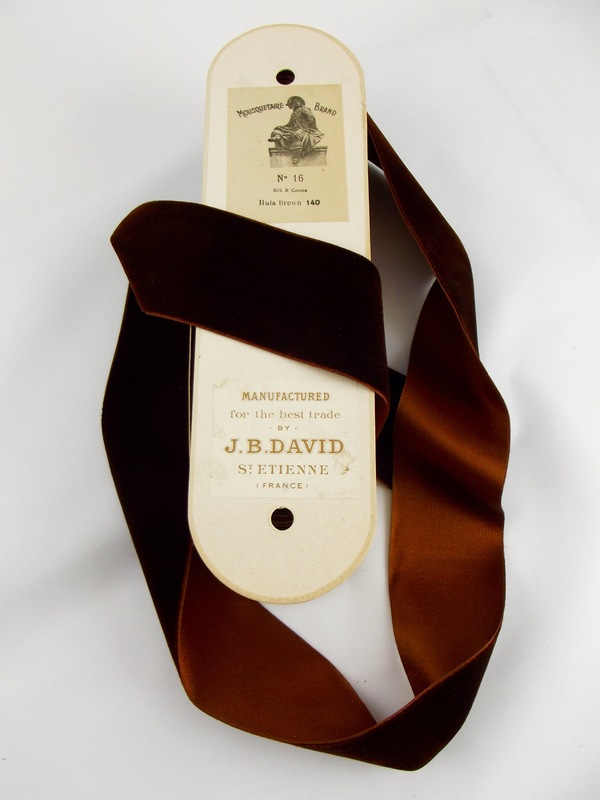 Among the vintage options was this fabulous double face ribbon: velvet on one side, satin on the other. It is a silk and cotton blend, with the most luxurious hand. The color, called Hula Brown, is very beautiful, but what makes it interesting is the satin and velvet sides are different hues, like dark and milk chocolate. Plus, the packaging on the vintage options is incredibly charming! Any favorite projects you’ve seen made from your wares? Goodness, this is difficult to answer. 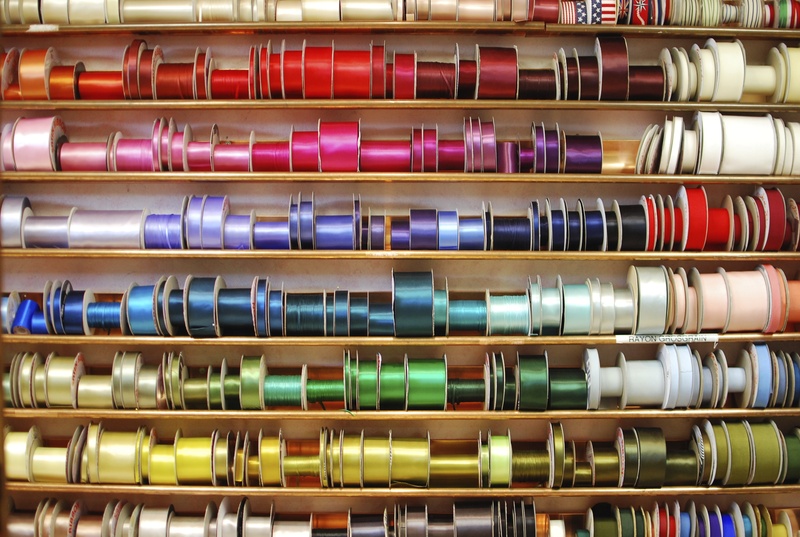 Like the woolens department, we have sold so much ribbon, veiling, and trims throughout the years that this answer could be a mile long. There are a lot of projects that are fun, but not necessarily unique. We work with lots of brides who are looking for ribbons to trim their invitations and programs, to make a veil, or who simply want a colorful sash. 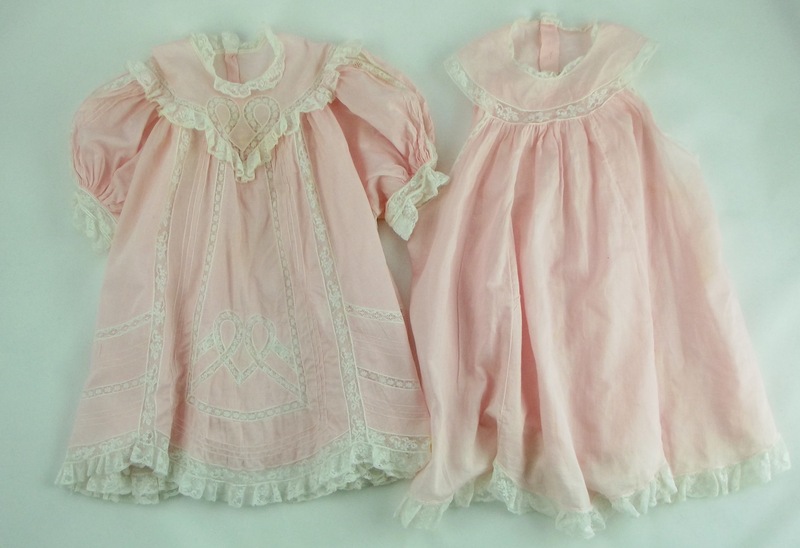 We are lucky to carry the embroidered trims, laces, and insertions that go into heirloom sewing, so we get to help people making christening gowns. 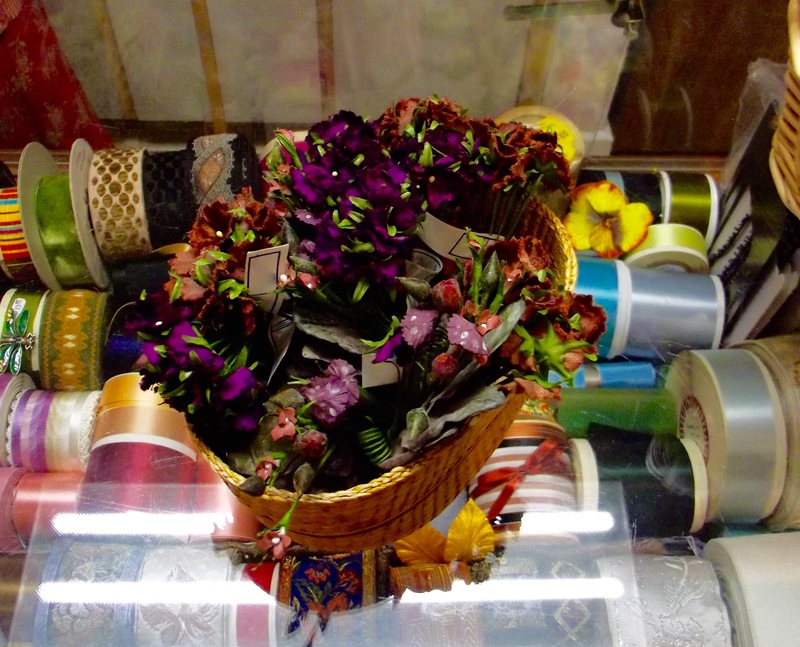 We also sell ribbon for things as simple as hair-bows and gifts, which are delightful. Beyond that, some highlights do spring to mind: Every time Candace Kling comes to teach a class at Nancy’s, we get to see our wares turn into incredible work: striped grosgrains become cockades, wired ribbon and stamens blossom into flowers, and much more. Working with antique doll collectors and miniaturists is always fun and surprising. It is also incredibly enjoyable to help people find the perfect trimmings for costumes, whether historical, for a local theater production, or for a kid’s Halloween costume! Thank you, Ribbon Room! It is always fun to see your treasures! From now until the end of the Nancy’s anniversary sale, the Ribbon Room will be featured for daily specials on Tuesday, Sept 15th (15% off flowers), Wednesday, Sept 16th & Friday, Sept 18th (15% off buttons), and Sunday, Sept 20th (15% off ribbons)! All pictures in this post copyright of Nancy’s Sewing Basket, LLC. Special thanks to Kam Martin for her photography skills. This entry was posted in NSB Interviews and tagged flowers, great gifts, interview, millinery, NSB department, ribbonwork, Vintage, vintage style. Bookmark the permalink.